The X-Series earmuffs are 3M's latest advancement in hearing conservation. New technologies in comfort, design and protection all come together in thsi groundbreaking earmuff line. 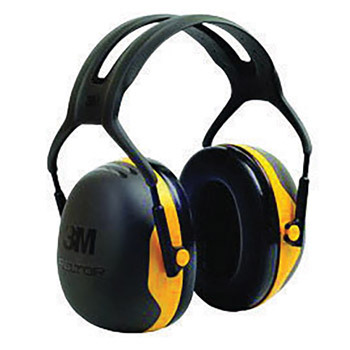 The X2A is a lightweight, lower-profile earmuff designed for protection against low-to-moderate level industrial noise and other loud sounds. It features an electrically insulated wire headband, ofted referred to as "dielectric". The X-Series (over-the-head) headband version is electrically insulated-sometimes referred to as "dielectric". The metal components of the headband have been covered by non-conductive material for use in a low voltage electrical hazard (less than 440 V ac). As there are no applicable standards for testing muffs against electrical insulating properties, the product has been evaluated at an external laboratory against a modified test method based on EN 397:1995. During assessment, the leakage current did not exceed 1.2 mA when the external surface of the product made contact with an eletrical source. The user must determine the overall suitability of this product for the intended application taking into accound any hazards other than noise for which this product is tested. The NRR may overestimate the hearing protection provided during typical use. 3M recommends reducing the NRR by 50% for estimating the amount of noise reduction provided. 10 each to a case.